Werrington Athletic Under 13s are pictured before their 8-2 win over Glinton & Northborough Amber. From the left are, back, Jakub Szreder, Zain Meghji, Kyle Irving, Jebreel Younis, Archie Makepeace-Beach, Shaun Gear, William Barfield, Charlie Allport, Isaac Shaw, front, Ali Ismail, Tom Nash, Tyler Harper, Rivell Koboci, Hayden Jelfs, William Sheffield and Callum Kerr-Gray. There were massive wins for two Peterborough Junior Alliance League sides in county cup action on Sunday. Both came in the first round of the Hunts Under 14 Cup with Yaxley Blue smashing Parkside Athletic by a staggering 27-0 margin and Hampton Blue cruising to an 11-0 triumph against Park Farm Pumas Red. Glinton & Northborough Amber Under 13s are pictured before their 8-0 defeat by Werrington. 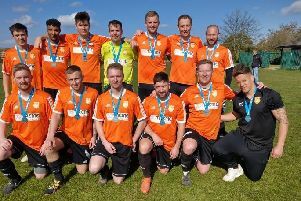 from the left are, back, Tom Steward, James Smith, James Connell, Terry Smith, Callum Yates, Andy Sandel, Oliver Hill, Finlay Ribbons, Isaac Woodfield-Mills, Thomas Paul, front, Jonathan Hook, Max Sambells, Joe Sandel, Jamie Crowson, Luke Gill and Jack Crane. Two players - Marcus Goymour and Kyall Woods - managed five-goal hauls for Yaxley with Joshua Hogg and Alfie Webb claiming four apiece and Kyle Rowell and Jamie Lane firing hat-tricks. Completing the rout were Louis Whiffin (2) and Finley Kilby. For Hampton it was Rio Henson leading the way on the scoresheet with five, Luke Scampion hit three and Harry McLaughlin, Joshua Gore and Reece Campbell chipped in with one each. On the Under 14 league front there was a cracking 13-goal thriller involving netherton Pheonix and Deeping Rangers Claret. Netherton trailed 5-1 at half-time but stormed back in the second half to win 7-6 with goals by Emmanuel Ochube (4) and Daniel Laxton (3). Scorers for Deeping were Joshua Raven (3), Jack Sharpe (2) and Oskar Storti. Under 12 Division Four leaders Blackstones walloped Parkside Athletic 11-0 with Malik Karama scoring four.